Common journalistic wisdom has it that it takes three examples of a phenomenon to make a trend. 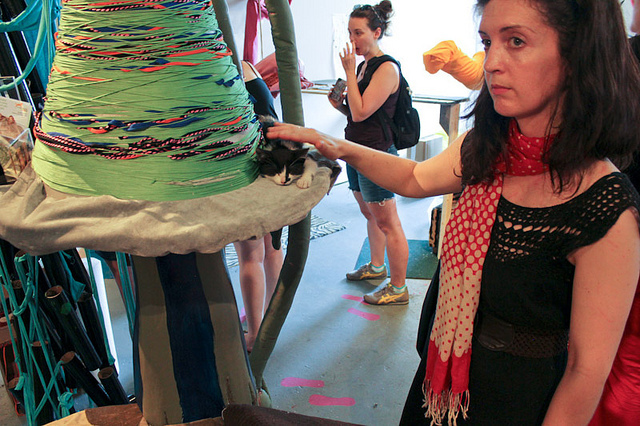 1) Kitty City, a metropolis/playground for cats that was built at Flux Factory in May and unveiled with a kitten adoption drive the first weekend in June; 2) The Cat Show, an exhibition devoted to cats, also with adoption drive (two!) and a zine, opening June 14 at White Columns; 3) Divine Felines: Cats of Ancient Egypt, a long-term installation opening later this summer at the Brooklyn Museum that will explore the role of felines in ancient Egypt. And I didn’t even mention last year’s Internet Cat Video Festival, which organizers will reprise this summer, or the Grumpy Cat Art Project at a studio in Alabama. The fact that we love cats is, of course, nothing new. But the art world’s embrace of felines does seem to be at a perceptible high. Was this inevitable, only a matter of time? Is there some new impetus moving us in this direction? Is the art world becoming more and more like the internet — or is it just desperate for wider attention? These are pressing questions of our time. As a cat-owning art person, and on behalf of others like me everywhere, I felt compelled to investigate. As soon as the cats arrived the morning of the ribbon cutting, they were jumping out all the holes in the fence, climbing into the joists in the ceiling, and trying to get out the window. We spent those hours frantically sealing up all the holes and feeling like we’re in way over our head. Back in the mid-’90s, I lived in a loft in Long Island City (LIC) and started tending an outdoor cat colony in an empty lot on my street. I wasn’t even a cat person when I moved in, but LIC had tons of street cats then and they pulled me in. The cat party started at dusk when we arrived with the cans. It was my favorite art installation at the time! Hi-rises were about to go up on the lot — displacing the cats my neighbors and I had grown fond of. We placed some and approached some rescue groups — all overflowing with adoptable pets — and that’s when I got a crash course in the over-extended rescue situation in NYC. I thought it would be so amazing to help the rescue groups by creating an undepressing space where the public could meet the cats, a place where strays would be appreciated as the gorgeous creatures they are and not wretches in a cage-lined facility! I thought the cat area itself was a great installation and this project would use the art context to actually facilitate adoption — as well as being an aesthetic, meditative space. Contrary to popular belief, the ancient Egyptians did not worship cats. But they did associate felines with several divinities, and revered them for their grace, fertility, hunting abilities, etc. On a more mundane level, cats protected the homes and villages by hunting mice, snakes and other vermin. Clearly, many of these features are still pertinent today. I am also sure that much like many people today, the ancient Egyptians were simply swept away by the combination of charm, softness, and stern character of cats. Yep, “charm, softness, and stern character” pretty much sum up the appeal of cat selfies. On the surface, the pedagogical urban-planning exercise, the contemporary art show, and the ancient art show don’t seem to have much in common beyond their feline focus. But that may actually go a long way toward explaining our cultural obsesssion with cats — they work as an expression of our own personalities, interests, and pursuits. We love cats, and we project onto them; we name them and portray them, we devote exhibitions to them. We use them to reflect ourselves, making sure we also hold adoption drives along the way (help them while helping ourselves). Or maybe that’s just what they want us to think. Maybe all these shows really mean is that cats are one step closer to ruling the world — or at least duking it out with robots for ultimate control. This is, in fact, a question I put to all of my interviewees: are cats taking over the world? “No, rats are,” said Paulson. “Well they’ve taken over the internet, that’s a start,” said Lieberman. “I think they already have,” said Barbash. Who knows, then? Maybe it’s not Jillian Steinhauer writing this article, just a lady cat with friends in high (art-world) places and a Jewish-sounding pen name. Cats may not have opposable thumbs, but it doesn’t matter now that we have iPads. Planning and building for Kitty City took place every Saturday in May at Flux Factory (39-31 29th Street, Long Island City, Queens), with the final project unveiled at a ribbon cutting on June 1. The Cat Show opens at White Columns (320 West 13th Street, Greenwich Village, Manhattan) on Thursday, June 13, from 6 to 8 pm. Divine Felines: Cats of Ancient Egypt opens at the Brooklyn Museum (200 Eastern Parkway, Prospect Heights, Brooklyn) on July 24.